We hope this guideline will make it easier for you to obtain an impression of Norway’s most northerly, ‘Southern’ town. We suggest that you choose one or more of the three tours, depending on how much time you have. All tours start from The Tourist Information Office and the Aquarium in the harbour 1. Drøbak is one of the Oslo fjord’s historic summer resorts and to a large extent the time of the year will decide if it lives up to its description of being, “a pearl by the Oslo fjord”. Drøbak is situated at the narrowest point of the Oslo fjord. From about the middle of the 1700s and onwards, this tiny coastal hamlet developed into a small town, supported by the timber industry and shipping. The town obtained its own Trading Charter rights in 1842, prior to this it was controlled by Christiania (Oslo). From 1850 until 1900 the export of fresh water ice to the Continent and England was a very important trade. Even though we think of Drøbak as a typical small town, it is worth recalling that in 1800, Christiania had approx. 8,000 inhabitants, Moss 2,500 and Drøbak about 1,100. The municipalities of Drøbak and the surrounding district of Frogn were amalgamated into one unit, or kommune, in 1960. We do not know exactly what the name Drøbak means. Most probably it is related to the Norwegian words, ‘Drøye bakke’ which literally means, (for a man and his horse) an ever-lasting hill, a hill that drags on and on. Drøbak was also used as an outer port for Christiania. In the days of sailing vessels the inner regions of the Oslo fjord were often frozen during the winter months and ships were unable to reach the city. The water around Drøbak was ice-free for most of the year. Cargo destined for the capital could then be discharged in Drøbak and transported over-land and the frozen fjord by horse-drawn sledges. Some of the ships that were registered in Oslo were often laid up for the winter in Drøbak in order to be rapidly commissioned at the start of a new freight season. Ships were laid up at Kaholmene (Oscarsborg) and in Vindfangerbukta (literally, ‘Catch the wind bay’). On our first tour, we walk from the harbour, which was established early in the 1920’s, passing through «Fiskerkroken», between small wooden houses from 1700-1800’s. We now arrive at the market, the centre point of Drøbak, which was renewed by the world renowned architects, Snøhetta, in 1997. Life in the market square is often very active with everything from market stalls, charity lotteries (for home-made cakes, etc.) concerts and political meetings. Looking west, towards the fjord, to the left we can see Storgaten 1 2, a Merchant house from 1800, which was a secondary school for many years and, prior to that, a hotel. It has been in the possession of ship owners, timber merchants and exporters of ice as well as the Consul for the Netherlands, Henry Parr Samuelsen. 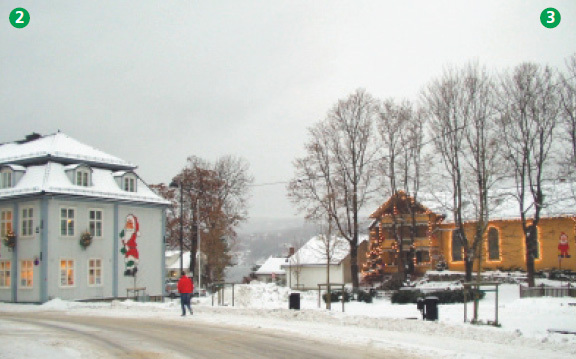 Behind the tiny park with the statue of a fisherman catching the famous Drøbak cod is Tregaardens Julehus 3, this was originally a chapel, it is now the House of Christmas where the festive season of Christmas can be experienced all year round. 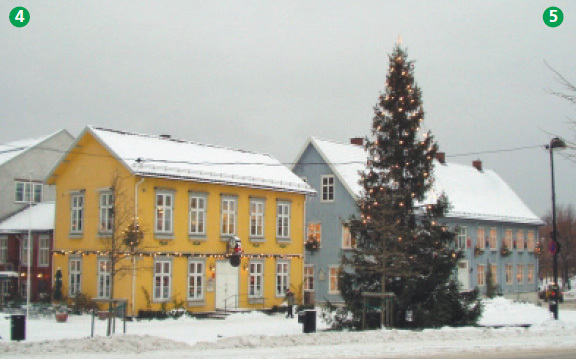 The next houses are «Julenissens postkontor» 4 (the post-office of Santa Claus) and the library 5. The library is built in the style of the late 1700s, with a rococo curve to the roofline and with a Louis XVI main door opening to the market place. Earlier, both buildings have been used as schools and prior to that they were the private homes of the town’s wealthy tradesmen together with their families and servants. 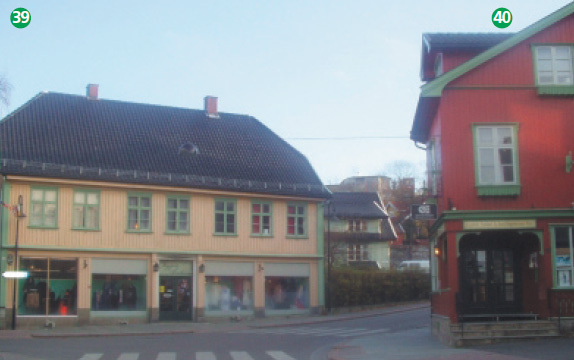 The large timber-merchant’s house on the right is a good example of how Drøbak was built; a centrally placed main house surrounded by smaller buildings for the labourers, the sawmill staff and the sea-farers. We know that in 1800 this property comprised several buildings. In addition to the main house there was an outhouse for the stable boys and there were stalls, pigsties and boatsheds, in all, some 12 buildings. Bankløkka, the large open area towards the church, was pasture and gardens belonging to the property. 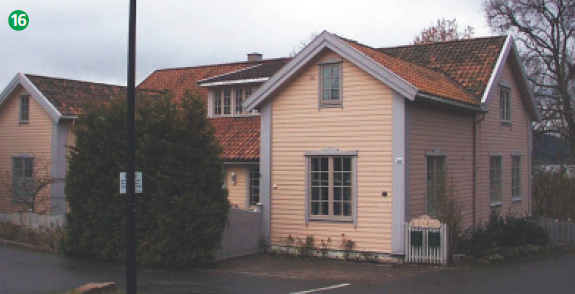 According to the people of Drøbak, Christian Magnus Falsen drafted the Norwegian Constitution in this house. The two yellowish (ochre) coloured buildings towards the east, on either side of Torggata (Market Street), are both well-preserved merchants’ houses from 1700 6. Kirkegatan (Church Street) with its avenue of trees which, when they were cut down provoked a public outcry but fortunately they were re-planted again in 2013. The avenue leads to the town’s church, built in 1776 7. The writing above the door informs us that the entire building was a gift from Niels Carlsen (a merchant and shipowner) and his wife, Martha Zachariasdatter. 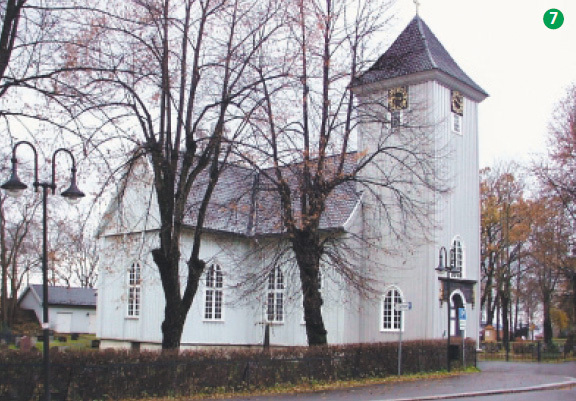 This is one of the only churches in Norway donated to a community by a husband and wife. The interior is very interesting. The altar board has the same motive as the altar board in Our Saviour’s Church in Oslo. A curiosity worth noting is that the church clock has only one hand. A bust of Niels Carlsen is situated close-by, in the garden, by the path 8. Niels Carlsen (1734-1809) was a rich businessman and one of the country’s most powerful shipowners at the end of the 1700s. He owned a large part of the property along the seafront as well as the small islands where Oscarsborg fort is now situated. He was the district’s most powerful and important citizen and benefactor, and demonstrated this by, among other things, his donation of the church. The inscriptions over both the main door and the entrance to the north door tell us much about the spirit of the times. The Carlsen family grave is a plot raised above the other graves in the churchyard. By the church is an entrance to Badeparken (Bathing Park), an area of smooth rocks, paths and beaches for swimming and walking. In the park we can see the old bath-house from the time when there was a very active spa situated in the park. It was then possible to have a Roman bath or a mud bath and other beneficial water treatments. Here, as in other places along the coast, efforts were made to attract visitors and develop tourism at the time when sailing ships had to give way to steam-driven vessels and the timber trade and export of ice were no longer of the same importance. In the middle of the park is a bust of Colonel Birger Eriksen 9. It was he who gave the order to open fire on the German cruiser, “Blucher” 9th April, 1940. The statue of the Colonel shows him gazing out across the fjord to his fortress from where the cruiser was sunk. This action helped to delay the German occupation of Norway by one whole day, making it possible for members of the government and the king himself to escape from Oslo and avoid being taken prisoner by the Germans. Some small distance to the east of the church is a characteristic square, wooden building that was also a donation to the community from the Carlsen family 10. It is called ‘Drøbak Hospital,’ and a board over the main entrance (facing east) tells us of the donor’s intentions for the house (for the benefit of impoverished widows). This became the town’s first Old Peoples’ Home, but today it is used by the church and for Senior Citizen activities such as a canteen, a hairdresser, a chiropodist and numerous hobby activities and contact personnel for senior citizens. Immediately to the south of the ‘hospital’ is yet another plank-boarded building from the 1800s 11. This house was the first school building in the district and was also a gift from the Carlsen family. Later, the building was used as an apothecary or chemist’s shop as can be seen from the building’s façade and from the wrought iron gate. In front of this gate there is a commemoration stone where the monogram of King Haakon VII and the year 1905 can be seen. The tour continues north along Niels Carlsens Street, and we see a large manor house at the point where the road divides 12. This house was originally Drøbak Manor and Carlsen purchased it around 1750 and built on to it. There have been several other buildings in the area, amongst others, an outhouse. After Niels Carlsen`s time the building became the property of the Magistrate, Hans Petter Ellefsen. The building is still referred to as, “Skrivergården” and is today owned by The Salvation Army. We follow the road to the right up along Sorenskriver Ellefsens Road where, at the top of the hill, we pass one of the present Homes for the Aged and Infirm, ‘Grande’ 13, a large red brick building situated on the left-hand side of the road. We turn left at the roundabout and walk down Hagenbakken. At the first junction we turn right and then walk down the steps of «Bentsebakken», towards «Sundbrygga». Here there is an excellent view of the Oscarsborg fortress 14. The fortress was instrumental in delaying the German invasion forces from reaching Oslo, an important event in Norway’s history. After this action, the cruiser, Blucher, finally sank at Askholmene which we can see further north in the middle of the ship’s channel towards Oslo. 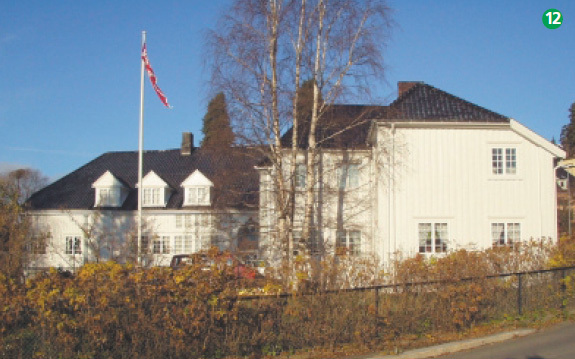 Since the autumn of 2002 there is no longer any military activity at Oscarsborg. If you would like to visit the old fortress, it is possible to board the ferry from Sundbrygga. We return to Husvikveien and turn right. The walls and the reddish-brown out-houses belonging to Ringgården obstruct our view of the main house from 1800 15. The property comprises the main house, numerous outhouses, a park and a garden pavilion. 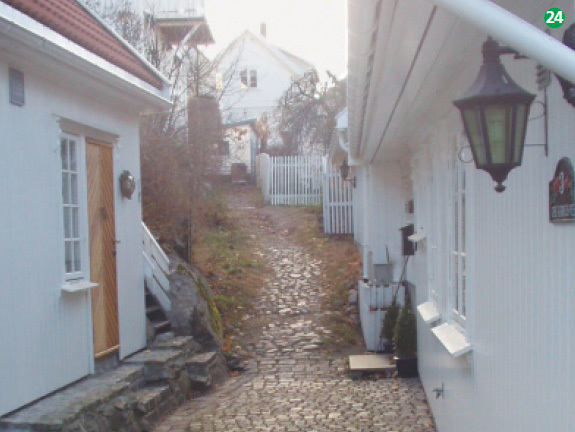 This property together with the collection of smaller houses is another example of how village groups sprang up in Drøbak, the influential and wealthy citizen occupied the large house which was surrounded by the more modest buildings of ordinary working people. Some few hundred metres further south along the road, opposite ‘Skrivergården’ is “Villa Parr” 16. Søren Parr owned the house from 1850 and he was one of the leading exporters of fresh water ice in blocks. Norwegian fresh water ice, was an important industry in this area from 1850 until the First World War (1914–18). The ice was shipped to Great Britain and Holland. On the grass lawn that reaches down to the sea there used to be a row of several ice houses used for storage of ice. It is still possible to find some of the sailing ship mooring rings scattered throughout the area. Varmbadet 17 (Hot and cold baths), where mud baths and massage were also available as early as 1902. 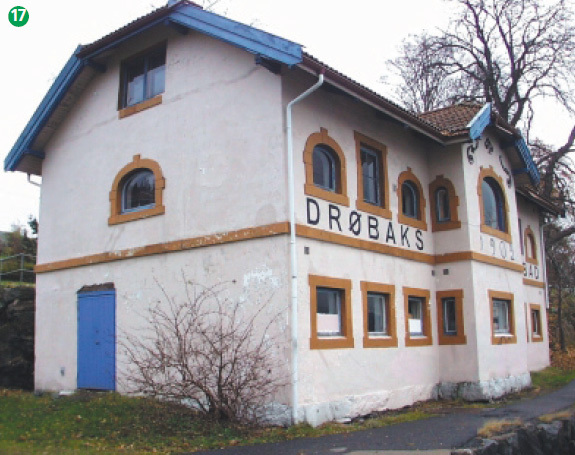 Nowadays the building is used all year as a gallery for art and others activities by The Old Drøbak Preservation Society and The Drøbak Art Society. Adjoining this building is the area that was used for swimming in the sea with separate bathing areas for men and women. Only a small section of the buildings still stand. We continue past the ‘Park-Cafe’ and the Bathing Park amphi-theatre with its stage, used for entertainment during the summer. Staying on the path in the park and walking south over the rise in the hill we can see to the right, close to the sea, a large building in Swiss style; this is the Oslo University’s marine biological station 18, built in 1894. We now come to the harbour. On the left hand side there is a collection of cement-faced buildings, which has previously been a boat-builder’s yard, an electrical power station, a chemical factory and a factory producing wallpaper. The buildings have now been converted into flats or apartments. 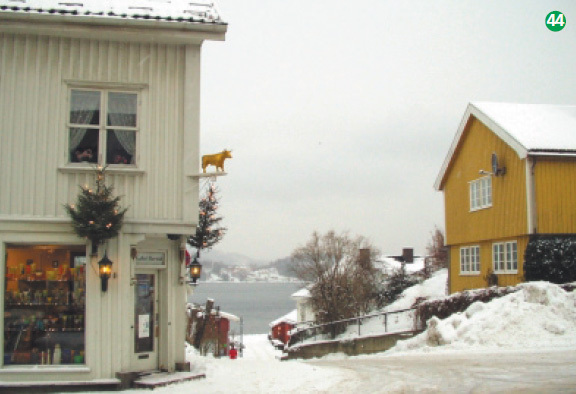 The large wooden building facing the harbour was once one of the many residences occupied by the painter Christian Krohg when he lived in Drøbak. 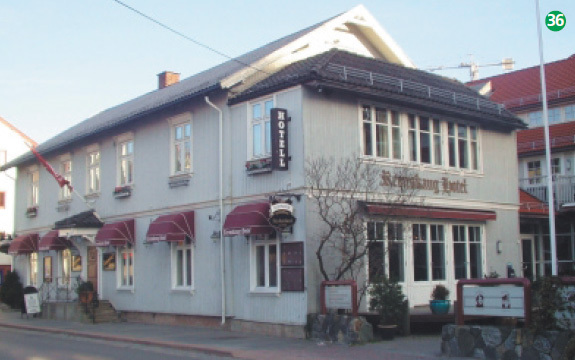 If we continue walking south we arrive at «Skipperstuen» 19 (The Captain’s Lounge) a popular restaurant, which is aptly named, as the house once belonged to a captain of sailing ships, Søren Hagbarth Haagensen. We continue south along the harbour and arrive back at the Tourist Information Office 1. From the Tourist Information Office 1, where the Aquarium and the «Lutefisk» Museum, (dedicated to a unique Norwegian cod speciality) are also located, we walk out along the ‘A’ breakwater, Molo A for a fine view of the Oslo fjord. From this point we can watch the large passenger ferries and the cruise vessels on their way in and out of Oslo. On the left, as we step out onto the breakwater we pass a bronze statue of three very attractive mermaids, a work by the local painter and sculptor Reidar Finsrud. When returning along the breakwater we see immediately ahead of us a collection of small houses surrounding the small strip of coast that many years ago was used for fishing boats (1750 – 1850). We turn right and continue south along Havnegata. The large open space behind the Tourist Information Office has been the site of business activity for many hundreds of years. In the 1700s the property belonged to the Carlsen family and was used as a loading jetty for the export of timber to Holland, England and other European countries. Subsequently, it was used as a yard for the sale and export of timber, coal and coke, and, later still, it became a large sand depot. Until 1974 there was a three-story-high shed on the jetty. Further south, the street names change from Havnegaten to Badehusgaten 20. This is where the bathing hut, which gave the street its name, was situated. It belonged to a Mr Larsen many years ago. The street, with its tiny picturesque houses, leads us past wooden buildings from the 1800s. A couple of less fortunate projects have been allowed to be built but, all in all, the old atmosphere remains unchanged. No. 23 has retained much of its original style. No. 18 and No. 25 have been reconstructed in their original style without much change. The large red house, No. 28 on the corner where the Badehusgatan meets Hamborgveien, is worth a closer look. This is a very old house with much of its original form still intact. The jetty to the right was previously both a cargo jetty and a passenger jetty for the old steam-powered passenger ships that docked at this jetty called, Hamborgs brygge 21. Here, there are very few of the old buildings left, but as compensation we have the ‘Guest Jetty’ with its pleasant restaurant and meeting places along the water’s edge. The Hamborg name is also given to the house and the street. The group of small houses to the left is known as «Filisterkroken» the origin of the name is unknown 22. Along the coast, to the south, is the old Customs Building, which today belongs to the University of Oslo 23. In years past, the Customs Building was at Sand on the opposite side of the fjord. As Drøbak achieved more importance the Customs and Excise offices were transferred across to the town sometime in the early 1700s. Drøbak Customs Office was very important particularly at the time of the prohibition of alcohol (1916 – 1926) when smuggling led to much dramatic activity on the fjord. We take a sharp left turn at Storgata 42 and walk up Tollbodbakken and turn right. Here, between No. 8 and No. 3, is the beginning of the town’s narrowest thoroughfare, Christian Krohgs vei 24. In some places the walls of the houses are so close to each other that by stretching out both hands it is possible to touch them. This lane is called «Bråtan» and many artists have strolled along here. Anton Thoresens vei is named after Drøbak’s own much-admired local painter 25 he lived in No. 3. Where No. 7 towers above the other houses Wilhelm Otto Peters lived 26. We walk down Petersbakken and turn left into Jørnsebakken by No. 16, and then continue up the hill. Here we reach the original town boundaries where Jørnsebakken merges into Vestbyveien and gradually levels out. We continue until we reach No. 47, a restored house in Swiss Chalet style 27. Before we turn off to the right, down Wilhelmsbakken, continue 200 metres along Vestbyveien and take a look at «Maurbakken» No. 54 (Anthill) with its bay windows and small garden pavilion. 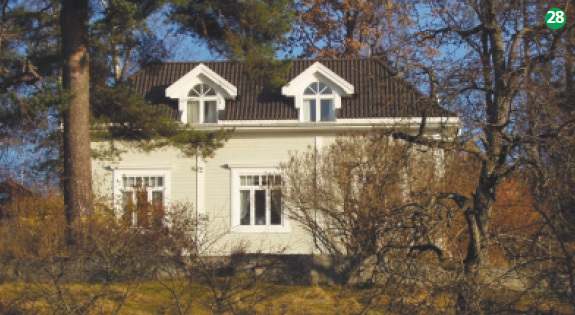 The Norwegian writer, Knut Hamsun built this house in 1905 28. Some distance to the south are the lovely bathing beaches and public areas of Torkildstranda and Skiphellebukta. However, our tour takes us down Wilhelmsbakken to Johanne Dybwads vei. 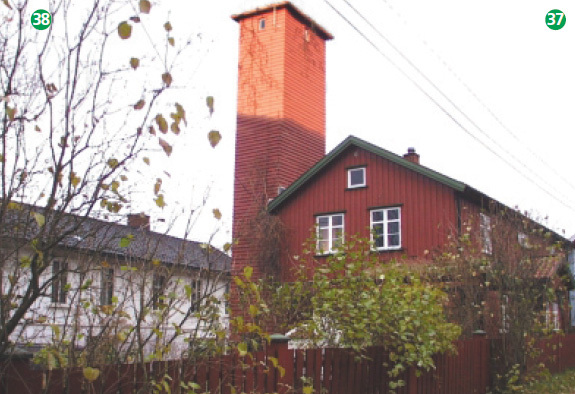 The low house, to the left at the road junction, belonged to the painter Edvard Diriks 29. 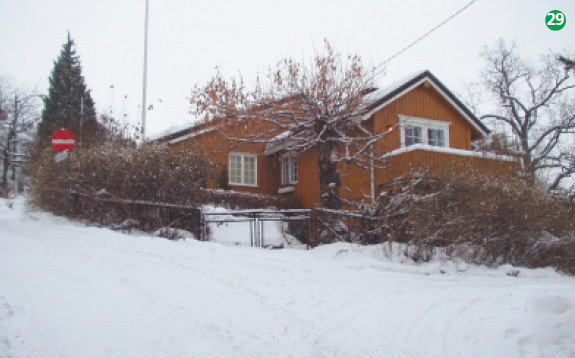 (Originally the house was a fisherman’s cottage with 2 small rooms; and it was here that Peder Klausen, a fisherman, lived with his wife and their 9 children.) Diriks spent half the year in this house and the rest of his time in Paris. In 1903 Gunnar Heiberg sat at a desk in one of the rooms and wrote his masterpiece, «Kjærlighetens Tragedie» (The Tragedy of Love). Olaf Gulbransson, well known for his sketches and drawings, traced silhouettes of members of Diriks family here on the walls of the lounge. Where Johanne Dybwads vei ends is the large property that belonged to the painter Ludvig Skramstad 30. At the bottom of Wilhelmsbakken is Sprostranda, a lovely family bathing beach 31. We continue to walk north along idyllic Strandveien passing No. 3, which was previously called Obstfelders house 32. We arrive back at Jørnsebakken, to the left, at the junction, is the house and studio of the painter Olaf Holwech 33. Below Holwech’s garden is the pilot station, which for many summers is where the painter Christian Krohg lived. He used many people from Drøbak as models for his paintings, among others, the pilot in the painting «Grumset farvann» (Dangerous waters) 34. The long, ochre-coloured house at the bottom of Jørnsebakken, on the right, No. 2, dates from the 1700s and is worth a second look 35. We have now returned to Storgata. In this road we find the Reenskaug Hotel 36. When we arrive at No. 24, we turn off to the right into Tranga (meaning narrow) – a narrow lane. Some way up the lane we pass the town’s earliest fire station 37, which still has the tower used for the drying of fire hoses. (No. 3) The long building behind the tower (Damveien 6) was once used as Drøbak’s overflow prison 38. The prison was known for being easy to break out of, to the great pleasure of the Oslo newspapers. Tranga eventually ends up in Osloveien. Here we turn left and walk down the hill to the market square and continue back to the harbour 1. From the Tourist Information Office 1 we turn left and walk along the harbour and up the hill at Skipperstuen 19 to the market. We continue eastwards along Torggaten 6 . At the end of this street is a well-maintained building, which for many years has been a shop for the sale of clothing and haberdashery 39. Previously this was the site of the «Samlag» an early version of the Vinmonopolet. The left hand side of the building was used for the sale of spirits and, to the right, was a room where one could buy, and drink, a dram for 10 øre. On the opposite side of the street there is a red, well-restored building 40, «Tregaarden» where the merchant or tradesman Skancke had his provisions shop, he also resided in the building. It is said that the artist Olaf Gulbransson, who also illustrated «Trangviksposten», used Consul Skancke as a source of inspiration in the creation of his figure Major von Knarren. Today, the building is an exhibition gallery displaying the cartoons of Fredrik Stabel and other newspaper caricaturists. Adjacent to the Skancke Building is a large brick building – Mission House, which replaced Drøbak’s first printing and newspaper office that burnt down in 1901. At the foot of Buggebakken is a small road, Fjellveien, leading off to the left by Buggebakken No. 4. On this tour be ready for a hilly trip. We follow the many twists and turns of Fjellveien and continue on up. We are in the part of Drøbak poetically referred to as «The hills in the East.» Where Fjellveien joins Seimbakken we turn right and continue to the junction at the top of the hill. The large white house to the left is the vicarage 41. We continue along Seierstenveien, the road to the left leads to the secondary and primary schools and on to the sports complex, the Follo Museum, Veisvingbatteriet (gun emplacements) and extensive walks in the surrounding woods and forests. Seierstenveien leads into Osloveien where we turn right along the cycle and pedestrian walk-way. After a short distance we arrive at a red barn on the right hand side 42. 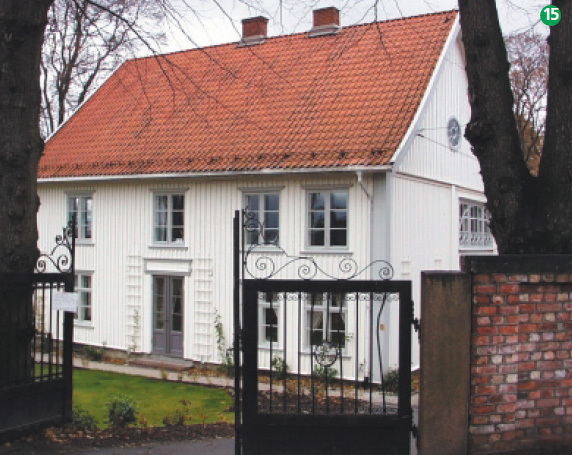 This is the last of the out-houses belonging to the «Løkke – property, Bochlum Farm, or manor. Farmers from the surrounding countryside could leave their horses here whilst they continued with their errands down in the town. With great caution and attention to the traffic cross the road and continue until we get to Tranga – the narrow lane, so appropriately named. The whole area is called, «Råkeløkka.» (Cow-path Common). Tranga No.3 with its tall hosepipe tower was the town’s fire station 37. 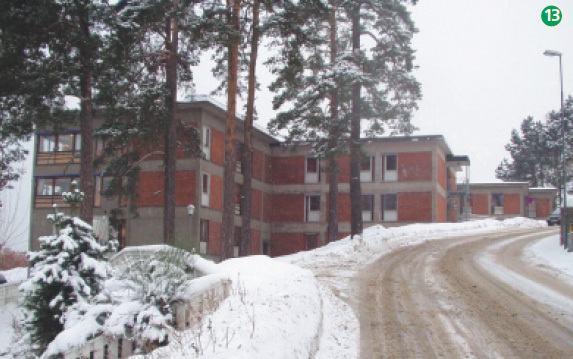 Further down the hill, to the south, is a long building (Damveien 6) 38, which, on the ground floor, was the town’s overflow prison famous for its lack of security. At that time life was really quite pleasant, the town’s entire police force comprised only one man, and he, apparently, was very short in stature. Tranga continues on down, but now it is not so narrow. Eventually we arrive in the town’s main street, Storgata at No. 24, here we turn left. We pass Hotel Reenskaug 36, and some restaurants, and arrive at No 43, which used to be the Customs Office 23. 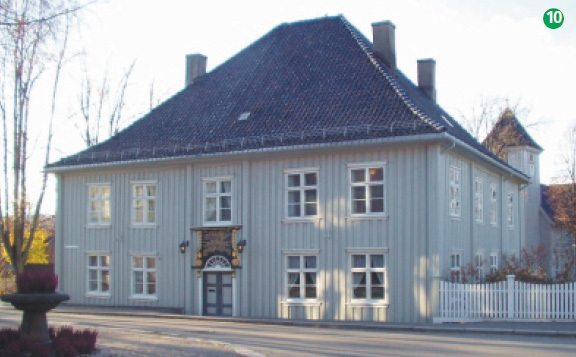 Drøbak Customs Office was an important institution, particularly during the time of prohibition of alcohol (1916 – 1926). 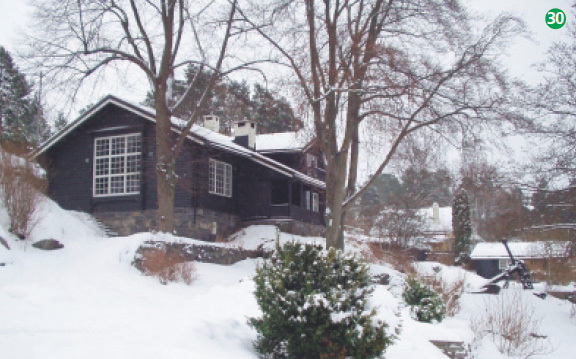 However, all customs activities have long since ceased and the building is owned by the Oslo University and houses the University’s Biological station. In this part of town we find some of the most historic buildings. 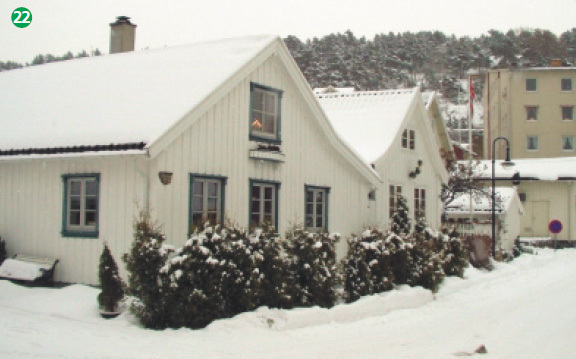 At the very end of Storgata is Lehmans Quay 43, named after an influential businessman from Drøbak. At the Steamship Quay is the bus terminus and the point where the ferry used to load passengers and vehicles. At one time there were as many as 20 sailings and departures a day of both goods and passengers destined for Frogn, Vestby and Ås passing through. The quayside afforded one of the town’s main diversions during the day and the place attracted quite a number of interested spectators. Years ago, the last boat from Oslo arrived at 22.00 hrs. and during the summer months people walked up to Badeparken where there was often a dance arranged to the music of a wind-up gramophone. We turn back from the quay and continue along Storgata to the Customs Office. 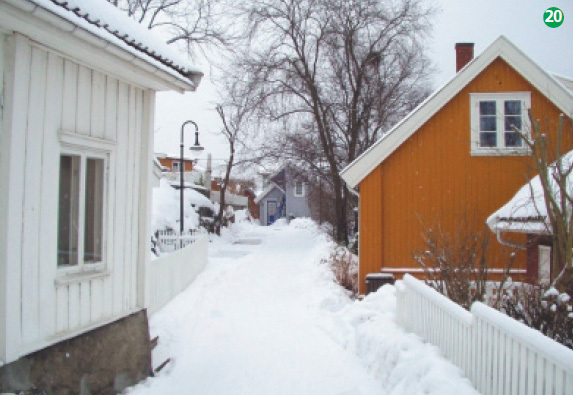 Here, we bear left into Badehusgata and visit the cluster of small houses, which are literally built wall-to-wall 22. This is Filisterkroken and there are many historians who disagree as to the origin of the name. To the left is Hamborg Jetty or Quay 21, earlier both a cargo and passenger terminal in the days of steam vessels. We walk along Hamborgveien and cross over Raskebekken (Quick or fast stream). This stream carried a lot of refuse into the fjord in days gone by. Continuing along Storgata we pass many of the town’s offices, shops and places of business. At the first junction we turn to the left, at the corner where Butcher Abrahamsen had his shop 44. Watch out for the bull! We walk down Carlsebakken and we are back at the aquarium and the Tourist Information Office 1. Perhaps these small, guided tours will stimulate you to explore on your own. By all means do so, because «The Pearl of the Oslo Fjord» has lots more of interest to offer visitors. Have a wonderful time in our town.